Paul Copan, “Who Are You to Judge Others?”—In Defense of Making Moral Judgments” available from http://www.rzim.org/publications/essay_arttext.php?id=9; Internet; accessed 05 August 2005, citing Caroline J. Simon, “Judgmentalism,” Faith and Philosophy 6 (July 1989): 275-287. Unfortunately, the verses appear irreconcilable. There isn’t a clear teaching on judging, whether inside or outside the church. Every possible take is clearly contradicted by a scripture or three. You are correct. I think our culture does misunderstand the biblical notion of judgment. Within the body of Christ, judgment ought to be intentioned toward reconciliation, love and holiness. From the body of Christ toward outsiders, judgment ought to be intentioned to point to their need for redemption. Outside of Christ, our culture is so drenched with an overdose of passivity and tolerance that nothing is taboo. Except taboos… and negative moral pronouncements. Which of course is judgment in itself. Even as I heard this I struggled with understanding the difference between judgment and making a determination based on fruit. Context is always important. The only way to conclude that the Bible is contradicting itself on this topic is if one does not pay attention to the context. Unless the Biblical authors were complete buffoons who couldn’t recognize a self-contradiction, clearly they did not understand non-judgmentalism to mean you can’t make moral judgments or tell people their behavior is sinful. The whole of Christianity stands on the notion of making moral judgments. What they did not accept was hypocrisy, a sense of moral superiority, and people acting as though they were the final judge on people’s salvation. Jason, I agree with your thoughts on judging. Context is everything or you will be confused about the whole topic. In the arena of moral judgments, I have found in my experience that some things that are not morally wrong are deemed by some groups to be morally wrong and visa-versa. We need to judge righteous judgment and not be legalistic as some are prone to be. There is nothing more appalling than a Christian who believes he/she is morally superior than another because he/she keeps certain “standards” that others do not. This is the epitome of self-righteousness and does damage to the cause of Christ. Yes, there is a difference between explicit moral judgments contained in Scripture and how we think certain Biblical principles are best applied to modern culture. When we place our cultural applications on par with Scripture we get ourselves into trouble. There are two types of judgment- right and wrong. Righteous judgment is judgment according to the word of heaven whereas unrighteous judgment is judgment contrary to the word of heaven. Simple as that. I don’t think this is about context. You’re imposing your own interpretations onto the teachings, finding a context that’s not there. Where do you see support in Scripture for the varying, alleged meanings of judgment? What about Jesus and the adulteress? “Let the one of you without sin throw the first stone.” They were using the judgment of Scripture as to her behavior (not judging her eternal fate) and were essentially told not to judge her. Implicitly, no person who sins should judge any other person’s actions. Arthur, sometimes these concepts are hard to express in words. I find this topic especially difficult. I believe we are supposed to “judge” other people’s actions as well as our own. I need to explain how I am using the word “judge” here. If you take the example of the woman caught in adultery, I would judge that her actions are wrong. I could even go so far as to tell her that her actions are wrong. I am making a judgment call on her behavior but that does not mean that I am going to through stones at her. The throwing of stones is metaphoric of passing final judgment without any chance for forgiveness. Jesus is not teaching us here that we should not judge, rather He is teaching us to show mercy in light of the judgment that is rightfully due to the sinner. Judging right from wrong will never change, but how we are supposed to respond in the light of Christ is supposed to change. Jesus teaches us that mercy should be shown by us to those who sin just as God has shown mercy to us. We cannot expect to receive God’s mercy unless we show it to others. That does not mean we through away judgment. We need to always love righteousness and justice as the scripture says. You may say how can I love justice ? I love the fact Jesus satisfied God’s justice for my sin and has decided to grant me mercy instead. Great thoughts Jason and Naz! Context is always important. Just because Scripture sometimes speaks against judgment, while at other times recommending it does not mean it is being contradictory. One has to determine what is meant by judgment in each context. For example, in Mt when Jesus talks about judgment He clearly is not meaning any moral condemnation, as He goes on to instruct a person to remove the speck from his brother’s eye. I don’t think the story of the woman caught in adultery was part of John’s original text, so I don’t have a problem with that. But even if it was original to the text, or if it is an actual even in the life of Jesus, Jesus could have simply wanted the people to see their hypocrisy. They were quick to judge the woman who was caught, but not quick to judge their own secret sins. However one might explain it, surely Jesus would not have contradicted himself on the issue of judgment. Holiness is the exclusive way to eternal life. Anyone whom do not affirm the way of Holiness shall be judge unholy and not worthy of life eternal. You mentioned the story of Jesus and the adulteress from John 8. You assert that Jesus’ challenge to the crowd for the sinless individuals among them to play the role of executor is His way of telling them not to judge her. If that were the case, why then would Jesus say “go and sin no more”. By identifying her actions as sinful and commanding that she not commit them anymore, Jesus was judging her. If Jesus is in one breath telling her accusers not to judge and in the next breath is, Himself, judging the woman, he is just as much of a hypocrite as those that brought the woman to Him. You example, when examined in the proper context, actually illustrates the point of this article quite nicely. The crowd was being judgmental, Jesus was rightly judging and extending His mercy. Good post Jason. Definitely a topic that needs to be more clearly defined. It also goes along understanding why Jesus said call no man a fool or “Raca”. It was basically telling people to never tag someone permanently as being a loser or a good-for-nothing. Your right in that he never censured judgement in the sense of constructive criticism but in contemptible judgment or as you quoted, “an inappropriate sense of moral superiority over another because of that person’s moral failures,”. Hi Jason, I am pursuing the same line of thought that this verse is misquoted. 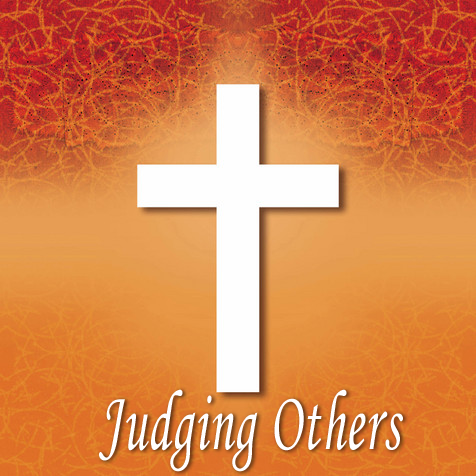 I am writing an article on the topic of judging and would like with your permission to copy your image of the cross “Judging Others” and link it back to you. May I please? (msdoraspen@gmail.com) Thanks a million! Hi MsDora. The image is not original to me. I borrowed from who knows where. Got it from Google images. By the way, I found this explanation in Jamieson-Fausset-Brown Bible Commentary (Read the whole quote in the commentary): . . . we are not only warranted to sit in judgment upon a brother’s character and actions, but in the exercise of a necessary discrimination are often constrained to do so for our own guidance. It is the violation of the law of love involved in the exercise of a censorious disposition which alone is here condemned. And the argument against it-“that ye be not judged”-confirms this: “that your own character and actions be not pronounced upon with the like severity”; that is, at the great day. My name is Elizabeth, I am not a theologian but a professor in psychology at a Bible college. In preparing my next lesson about typical cluster of emotional problems, I came across this article which help me expended a little more about judging self and others. This commentaries has enrich my perspective in the meaning of judgmental-ism and I appreciate your comments. Thank You!! Judgment can mean condemnation; Judgment can also include forgiveness; chastisement. Judgment may be flexible, “go and sin no more”; or, favorable: “your faith has saved you”. Judgment of right and wrong can also be cultural, environmental, religious; not necessarily morality of humanity but morality by traditional influence. Judgment can have moral implications people/people and amoral judgment people/nature. Gravity like caricature concept gods loves no more the man who defies it not, and loves no less the man who does. Defying gravity by climbing the high mountain also carries the chance risk of falling, slipping and that too may be without remedy, as white water rafting, sailing out of port during a wind storm. Who puts themself in peril may perish. Good judgment, good discernment, good discretion and good luck in your career. Religion is like an elephant you have to kill one bite at a time. It is true that Evolution never happened, it just evolved. Creationism basically is Evolution speeded up and Evolution is Creationism slowed down. Even the Bible supports Evolution, it took 6 days to create the earth etc but if you read the bible passages that say one day is like a thousand years and a thousand years like a day, you understand that time here is metaphorical so in fact one day may be like a million years and a million years like a day. Perspective like timing and context is everything. Some very well known theologians speak ill of other churches and justify what they do with their take on judging others through scripture. I believe they speak about others when the spirit they speak with creates disunity amonst Christians.